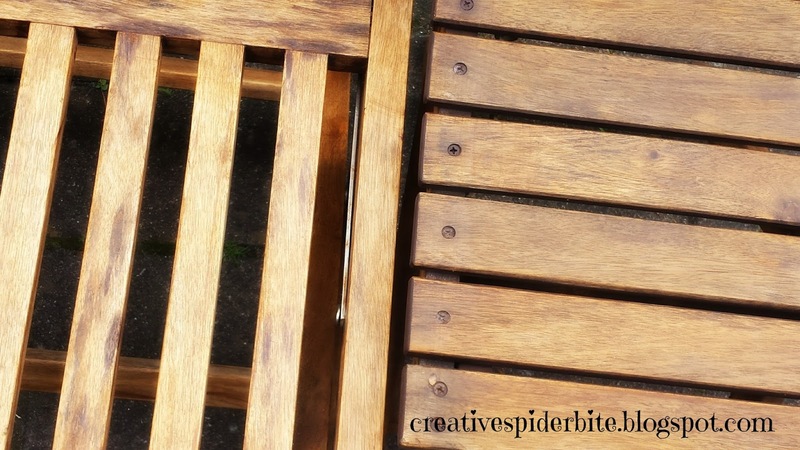 As you might remember I refurbished an old teak wood chair back in April (If you missed it, click here). I was surprised for how little money you could make it look like a new chair. I was also surprised when I read on the label of the teak oil can, that teak oil was actually made on a base of linseed oil and you could use it on any wood. There was still so much oil left in that can and no more teak wood furniture in this household so I thought of this very withered and old looking Ikea garden table and chairs set that I still had from my long passed student days. I thought I´ll give it a try with one of the chairs for starters. The chair is still very sturdy. It just looked withered and old. The poor fella never really saw any love and spent the last one and a half decades outside. So todays blogpost is about me experimenting with an old cheap and withered wooden chair, that most people would dump plainly for it looks. And I was surprised how fast this was done! All it takes is sand down the chair, brush off the dust with a hand brush. And wipe the oil on with an old sponge. I gave it two layers of oil. 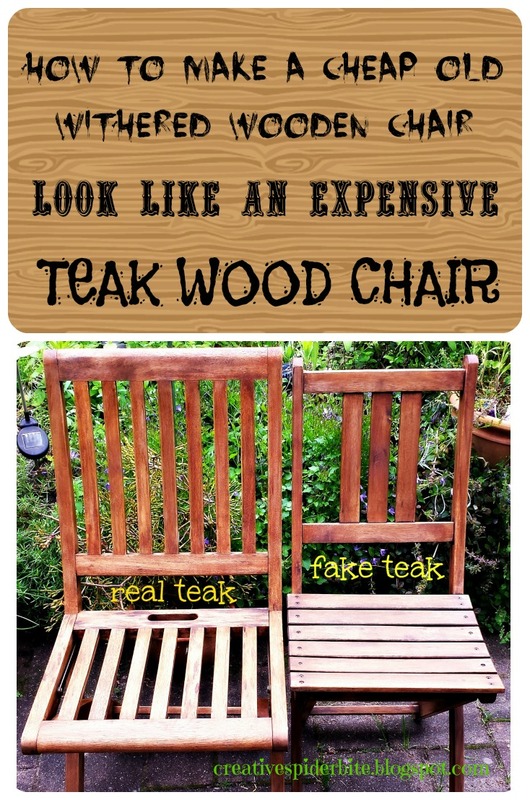 And Voilà: I present you a "teak wood" chair. This chair took me about an hour. I do admit using a power tool for sanding, though. Sanding by hand might need a bit more beef and time! 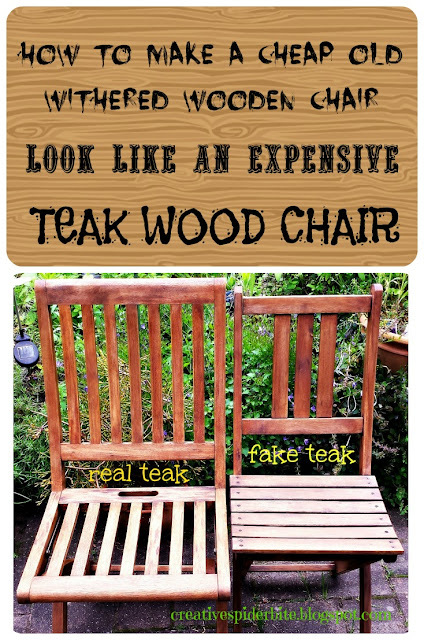 The cheap wood doesn't soak up the teak oil as quick as the real teak wood does, it might have something to do with how the wood was prepared before it was sold that time? 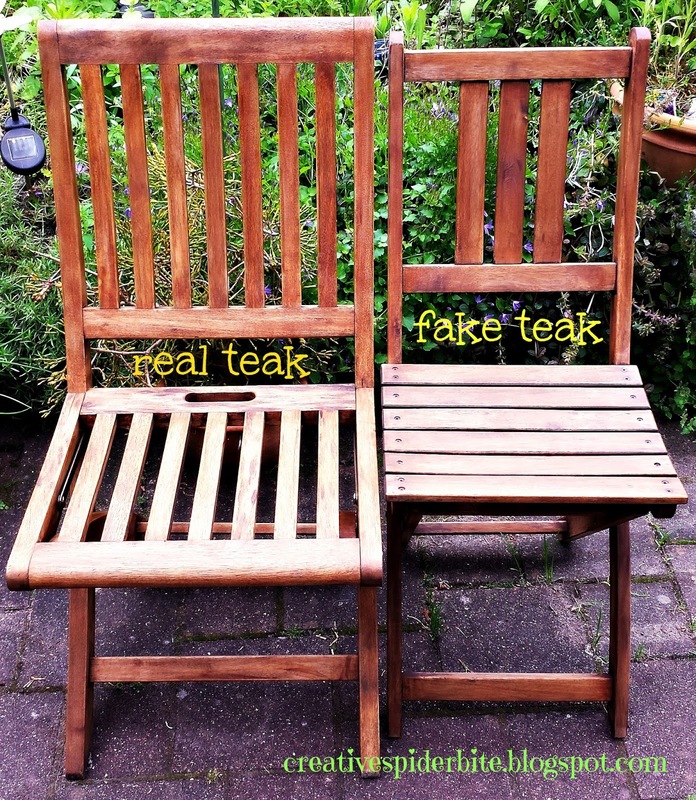 I placed the real teak and the fake teak chair side by side and you don't notice much difference in the colours between the real teak wood chair and the cheap Ikea chair that got the teak oil spruce. The can of teak oil cost me a little over 12€ and after refurbishing the two chairs I still have more than 3/4 of oil in my can. It goes a long way. I have one more chair and 2 little tables left of this Ikea set. Now I just need time to get around to it. This is actually amazing transformation. Not only it'll save money but also it'll help to save resources. Great idea! Thanks, Divyanka! And yes this project is very cheap! This was a great change really! 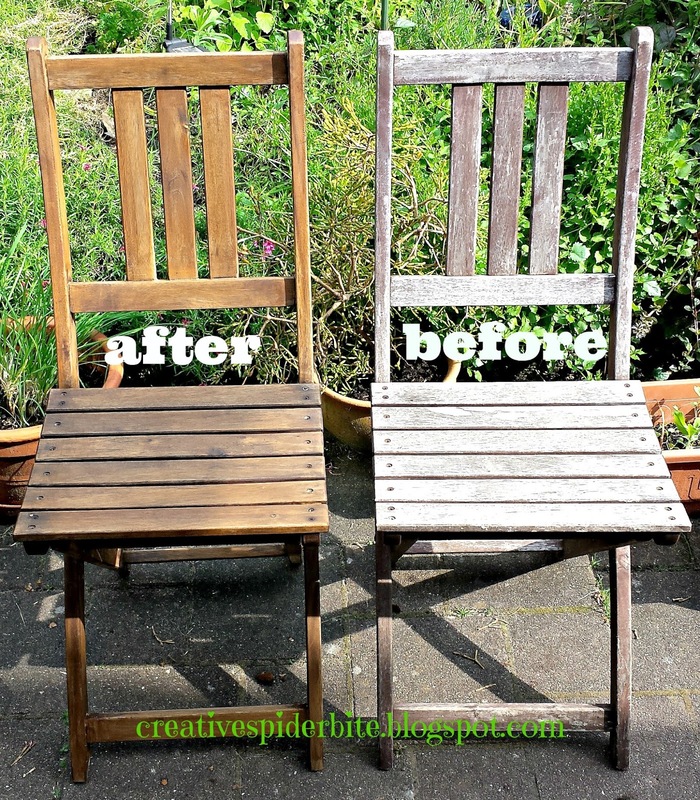 Never thought of giving wooden chair such a makeover! I never thought it would be this easy and fast! In my opinion it is well worth it. It turned out so beautifully. Did you sand by hand, or do you have a sander. I love DIY and I would love to try more projects in the future. There's so much that can be salvaged instead of throwing it away. Oh, man! This brings back memories. Thanks for sharing! Great job on the DIY. I really like how the chair turned out. Love it! It turned out really great. looks amazing. I love the idea of upcycling though me and DIY are bitter enemies but I love what you did. Thanks, Heidi! Sad about your relationship with DIY! Maybe you will find a nice upcycling project one day that suits you? Wow..this is so cool. Love the before and after picture..you can really see the difference. Thanks for the idea. You are as miracle worker!! That chair looks amazing! This is such a great transformation for little money and not too much time. Good for you that you had the energy for such a project. Thank you! Some days it is hard enough to find the energy or the time. Now, this one is actually cool and I believe it's definitely worth trying out. Nice share! Thanks, Sam! Yes it is definitely worth trying out. WOw, you did a good job I really cannot tell the difference between the two. I love when people upcycle old things. If it is something I have never done I always need some encouragement, too! This is really easy to do! I love a good diy!! You did a great job with the chair! Great and fantastic how little DIY tips can help save and solve a situation.